Plastic liquid holding tanks can be a hassle to transport, unless you have this unique tank designed to fit right in the bed of your American-made “mini” or full sized pick-up truck. The low-profile construction provides excellent rear view visual for drivers, which means safer transport. The tough linear polyethylene one-piece, seamless construction offers a long life. UV stabilized, it stands up to weathering in outdoor storage. 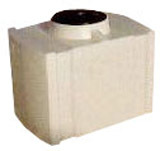 The resin used to make this plastic liquid holding tank complies with U.S. Food and Drug Administration regulation 21 CFR 177.1520 (c) 3.1 and 3.2 for the storage of potable water and its translucency allows for visual content level, to make your life easier.